On March 6-7th of 2019, JP Global Digital was excited to sponsor the 6th Eastern Mediterranean Gas Conference that took place in Nicosia, Cyprus sharing our expertise in developing efficiencies for operations, maintenance and safety procedures. 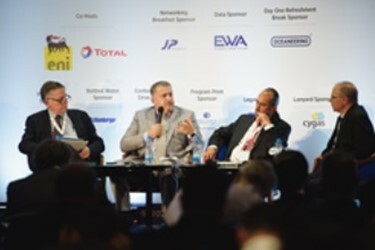 Houston, TX (PRWEB) - On March 6-7th of 2019, JP Global Digital was excited to sponsor the 6th Eastern Mediterranean Gas Conference that took place in Nicosia, Cyprus at the Hilton Cyprus Hotel. This event allowed delegates to obtain information on the region’s developing natural gas industry, gain entry to the regional markets and seek potential new business partners while allowing JP to showcase our 3D digital solutions. After two days of successful conversations at our booth, Bill Alashqar, SVP, Global Sales & Marketing participated in the E&P Technology Panel Discussion where he shared our expertise in developing efficiencies for operations, maintenance and safety procedures. In addition, JP had the pleasure to showcase the benefits of our 3D digital solutions during a presentation at the VIP Breakfast networking session. JP Global Digital is a leading global digital technology service company, providing abroad range of three-dimensional solutions to help companies pave the way on their digital transformation. Combined with JP’s unmatched engineering experience and expertise, coupled with our profound understanding of customers’ needs to create tailor-fit & comprehensive 3D digital solutions. With a presence in North and South America, Europe, Africa, and the Middle East, we can offer support and custom solutions globally. Our objective is to help our clients improve their performance and create sustainable value for their stakeholders.